Comments: A fun mix of feudal action and humor. The battle of Sekigahara is a popular prelude to a number of anime and manga series. 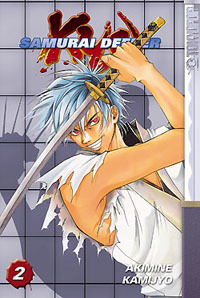 The event, which ended Japan's Sengoku Era (a time dominated by civil war between rival feudal lords) and signaled the beginning of the nation's prosperous Edo Era, is not only the starting point for realistic titles such as Vagabond, but also for Samurai Deeper Kyo, a manga that treads closer to the realm of historical fantasy than historical fact. In the first volume, the voluptuous bounty hunter Yuya Shiina captured Kyoshiro Mibu, a man whose paltry bounty is barely enough to pay for a bullet in Shiina’s gun. Exactly how she came across a gun in the fifteenth century remains a mystery, but in this series, the presence of a firearm in feudal Japan isn't the most unusual element. Probably the most important fact about Samurai Deeper Kyo concerns Kyoshiro, for trapped within his body as a second personality is the infamous "Demon Eyes" Kyo, killer of a thousand men. Kyo emerges when Kyoshiro is especially threatened, though while he has a frightening reputation and a terribly rude demeanor, his actions don't exactly seem like behavior befitting a true mass murderer. More of the mystery of Kyo will no doubt be revealed as the series continues. The story progresses at a good clip, with Kyoshiro traveling along with Shiina as she hunts the object of her revenge - a man with a scar. Even though this is a samurai manga, and Akimine Kamijyo writes praiseworthy fight scenes with greater than average skill, the story is the most compelling part of the series. It is by far the reason I've become so easily hooked upon Samurai Deeper Kyo. The author possesses a good sense of both humor and drama, with an emotionally equivalent amount of post-civil war trauma and stress-relieving, casual goofy humor. All of the characters are likable, and the pairing of the bloodthirsty swordsman Kyo with the medicine-paddling healer, Kyosuke, presents a pleasing balance between chaos and, well, really powerful destructive chaos. The artwork is detailed and sharp, and the characters' personalities shine through their illustrations well. There's a small bit of fan service (much of it at the expense of the undeniably cute Yuya), but nothing is overly gratuitous. Visuals in general are quite impressive, and the sharpness clearly influences the cleanly animated DVD incarnation of the series. TOKYOPOP has included a very handy cultural reference guide covering the last two pages of the book, which is a welcome addition to their already solid publication standards. Personally, I love background information, and any added material for any manga is laudable. Hopefully, as new installments of Samurai Deeper Kyo arrive, more bonus features will be published to supplement this engaging tale. Fans of samurai action desirous of a skew towards the fantastic owe it to themselves to pick up this treat of a manga.